Sometimes I lend a hand promoting very un-Cinedelphia-like films just as a way of rewarding the site’s loyal readers with the occasional freebie or two. Hence our dispersement of five The Expendables 2 prize packs that include things like a t-shirt, poster, dog tags, temporary tattoos, and a copy of the original The Expendables on DVD. To enter, e-mail us with your mailing address and the names of every actor on the poster to the left in left-to-right order. Winners will be chosen at random and will be notified by e-mail, deadline is Noon on Wednesday, August 15. The Expendables are back and this time it’s personal…Barney Ross (Sylvester Stallone), Lee Christmas (Jason Statham), Yin Yang (Jet Li), Gunner Jensen (Dolph Lundgren), Toll Road (Randy Couture) and Hale Caesar (Terry Crews) — with newest members Billy the Kid (Liam Hemsworth) and Maggie (Yu Nan) aboard — are reunited when Mr. Church (Bruce Willis) enlists the Expendables to take on a seemingly simple job. The task looks like an easy paycheck for Barney and his band of old-school mercenaries. But when things go wrong and one of their own is viciously killed, the Expendables are compelled to seek revenge in hostile territory where the odds are stacked against them. Hell-bent on payback, the crew cuts a swath of destruction through opposing forces, wreaking havoc and shutting down an unexpected threat in the nick of time — five tons of weapons-grade plutonium, far more than enough to change the balance of power in the world. But that’s nothing compared to the justice they serve against the villainous adversary who savagely murdered their brother. Schwarzenegger, with newest cast members Liam Hemsworth, Scott Adkins, martial arts legends Chuck Norris and Jean-Claude Van Damme, and Chinese actress Yu Nan as the first female EXPENDABLE. The film is directed by Simon West. Screenplay by Richard Wenk and Sylvester Stallone. Story by Ken Kaufman & David Agosto and Richard Wenk. Based on Characters Created by David Callaham. The film is produced by Avi Lerner, Kevin King Templeton, Danny Lerner and Les Weldon. Jon Feltheimer, Jason Constantine, Eda Kowan, Basil Iwanyk and Guymon Casady serve as Executive Producers along with Danny Dimbort, Boaz Davidson and Trevor Short. Lionsgate and Millennium Films present a Nu Image production. 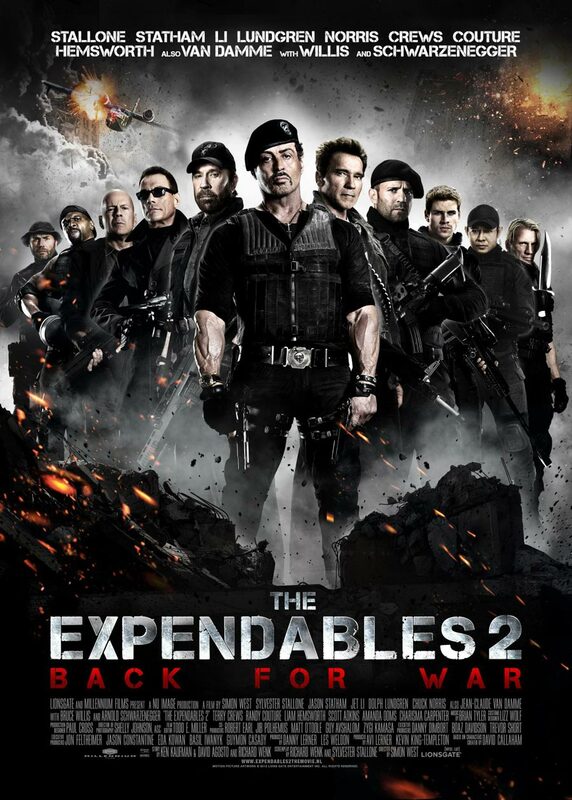 The Expendables 2 opens in Philly-area theaters on Friday, August 17.